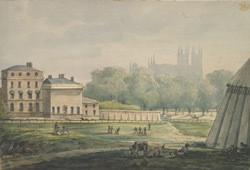 The Queen's Library was in the Green Park, at the south-west corner of St James' Palace. St James' Palace was a main residence for Tudor, Stuart and Hanoverian monarchs, especially after the destruction of the Whitehall Palace by fire in 1698. It held the library of George III's Queen, Charlotte of Mecklenburg (1744-1818), who continued to build up Queen Caroline's library collection.